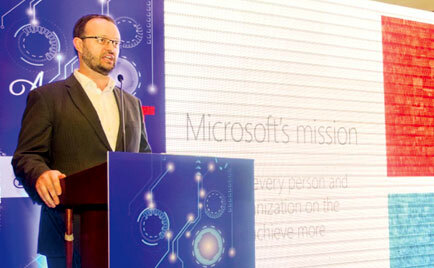 In line with its commitment to uplift ICT education in the country, Microsoft Sri Lanka hosted a conference between educators and technology experts to create awareness on using technological tools to educate young children. Held in participation of 150 schools and private educational institutes, the event focused on creating an ‘End-to-End Experience of Teaching with Technology’. This event acted as a preliminary introduction to the ‘Lets Teach WithTechnology (TWT)’; competition which is scheduled to be open to all the participant schools. The event comprised of several informative addresses on the role of technology in education and the importance of ICT knowledge in today’s economy and the job market. In addition, Microsoft introduced its O365 Education Free Plan to the event participants. O365 Education Free Plan provides each student and staff member withan email account, Skype for Business, 1TB of One Drive space and many other free tools. Several education partners of event namely, HeadStart, EWIS, DMS, SanjeLanka, Dialog, Softlogic and Toatal Amber displayed their own products and solutions at the event. “The event was a success and the impact we managed to create was inspiring. It was such a wonderful experience to witness the enthusiasm of all the educators and students alike. As a corporation thatspreadsaccessible technological solutions throughout the Island, we at Microsoft would like to work towards helping Sri Lanka’s future generation to become an ICT empowered and enterprising one. ‘Let’s TWT’ is one such initiative and we hope it will prove to be just as successful,” commented Country Manager of Microsoft – Sri Lanka and Maldives, Brian Kealey. Microsoft has been in Sri Lanka for the last 11 years and hasinitiated many partnerships and programmesto uplift the education space in Sri Lanka. Microsoft Corporation has a well-established reputation for introducing education focused software solutions. During the event in addition to O365 Education Free Plan, the Company introduced a range of free education tools such as OneNote Class book create/ Sway/Office Mix which helps teachers deliver lessons in a much interactive way. “Today, the world is moving faster than ever towards a time and space centered around technology. It is vital that Sri Lanka’s future generation follow in the wake of global trends and join this future of technology powered society,” added Senior Partner in Learning Management of Microsoft, YashinkaJayasingheAlles.